a promotion, or a new job. You’re making enough money, but who wouldn’t like more? You like your job, but you’ve been doing the same thing a while now. You and Michelle were hired the same week, but now Michelle is moving on. Next month she starts with your company’s main competitor – as personal assistant to the top boss. OK, not its real name. But that’s what the Admin Pro Forum Course Materials Binder actually is – a wealth of instructional materials with but one purpose: to jump-start your career. It’s the course materials for Admin Pro Forum 2018, the No. 1 conference and learning session for administrative assistants everywhere. And it’s a mouthful. That’s why I prefer to call it Success Kit-in-a-Box. Handouts and PowerPoints. Worksheets and cheat-sheets. Scads of online instructional materials – handbooks, manuals, PDFs galore. A package worth … well, thousands of dollars. Which is what you’d have spent if you’d attended the Admin Pro Forum 2018, where this binder was distributed to attendees. You also would have had to spent days away from pressing work and family matters. But with this binder and online materials, you get the best of the Forum – the distilled wisdom of the stars of your field – for just a fraction of the cost. So forgive me if I keep referring to it as Success Kit-in-a-Box. From stronger leadership skills to smoother office relationships, Success Kit-in-a-Box gathers together the elements that guide you to career success. Right now. The 14 tips for admins who want to think like leaders? The secrets of being an effective gatekeeper for a grateful boss? 9 mistakes even good minute-takers make? The best ways to prepare and present an administrative procedures manual? How to respond to crazy boss requests? 10 tips to complete a day’s work … by lunchtime? The tech tools that are on the rise, and the ones you need to leave behind? Mastering Microsoft Excel, with time-savers for every skill level. The art and science of minute-taking: Tips from the pros. 30 keyboard shortcuts in Windows and Microsoft Office. Aligned assertive communications. It’s a set of brain-based exercises and approaches to help you manage – and master – conflict. Handling the boss from Hell. Twenty-six fellow admins dish about nightmare office situations and how they handled them – successfully. Giving fear the boot. Dana Theus of InPower Coaching is your guide to breaking old habits that can hold a woman back. These are much more than workplace tips, as you’ll discover in dealings with family and friends. Anyone can give you advice. But this isn’t just any old advice. 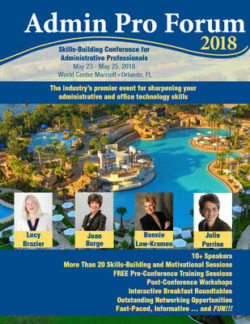 Melissa Esquibel, a frequent conference and webinar presenter, and mainstay for many national and regional administrative professional symposiums, including IAAP technical conferences and IAAP Summit. She is a Microsoft® Certified Trainer and Microsoft Office Specialist Master, and conducts training sessions for clients nationwide. She was this year’s Admin Pro Forum moderator. Julie Perrine, CAP-OM, MBTI Certified, an administrative expert, trainer, motivational speaker, and author. She is the founder and CEO of All Things Admin, a company dedicated to developing and providing breakthrough products, training, mentoring, and resources for administrative professionals worldwide. Julie has more than 20 years of experience in the administrative profession spanning several industries and serving in corporate and startup settings. Joan Burge, known as the groundbreaking pioneer of the administrative training industry. Her company, Office Dynamics International, is a global industry leader that offers a broad range of solutions and provides high-performance, sophisticated executive and administrative assistant training and coaching. Joan has authored four books, and her programs have earned the respect of premier clients like Disney World, Procter & Gamble, AT&T, Boeing, and Humana. Bonnie Low-Kramen, Founder of Ultimate Assistant and one of the most respected leaders in the administrative profession. The bestselling author of Be the Ultimate Assistant, she is known for her passionate commitment to being a catalyst for positive change in the global workplace. For 25 years, Bonnie worked as the Personal Assistant to Oscar winner Olympia Dukakis and now travels the world teaching and speaking. She is a columnist for Executive Secretary and SmartCEO Magazine, and is a top contributor on LinkedIn. Is it Really ‘in a Box’? “Yes,” in the sense that it does arrive in a sturdy cardboard box via UPS – an inch-thick-plus three-ring binder, tab-divided into 17 headings. You’ll discover dozens of online forms, charts, tables and formulas. Adapt them to your office situation with merely a click or two. Yes! I Want Success Kit-in-a-Box! Now … Can I Afford It? Can you afford cable service? Monthly heating/cooling bills? A few weeks of off-street parking? Success Kit-in-a-Box costs more or less the same as these routine expenses of daily living. But unlike, say, cable TV, Success Kit-in-a-Box pays dividends … forever. That’s considerably less than the registration fee for the Admin Pro Forum conference, and a lot less than going back for an MBA. But the career benefits? Comparable. Better, maybe. This low $299 price is only available for a short time. It pays to ORDER NOW. What Is Career Success Worth to You? Many administrative assistants didn’t go looking for their job. It was more a matter of the job finding them – a promotion from receptionist, say, or a temp job turning into 40 hours a week. People who come up through the ranks – people like you, perhaps – may have missed out on important career training along the way. But now it’s catch-up time. Order your Success Kit-in-a-Box today … and watch your career take off tomorrow. P.S. Success Kit-in-a-Box will help your career in the form of better pay, greater respect, added responsibilities, even a better job. I guarantee it. Put the tips and advice to work. You’ll start seeing results immediately. If not, just return the materials within 30 days and request a FULL REFUND. I’ll credit you with every cent you paid. That’s how confident I am that Success Kit-in-a-Box will lead to greater satisfaction with work and the workplace … and, yes, a happier, fuller life. P.P.S. Remember Michelle, who went over to the competition as right-hand aide to the boss? Michelle attended our Admin Pro Forum. She credits lessons learned there with helping her land that great new job. Counting tuition, travel, lodging, meals and incidentals, Michelle shelled out $899 to attend – her own money, not the company’s. Learn what Michelle learned. Discover the secrets that propelled her to the next level … for less than half the cost.